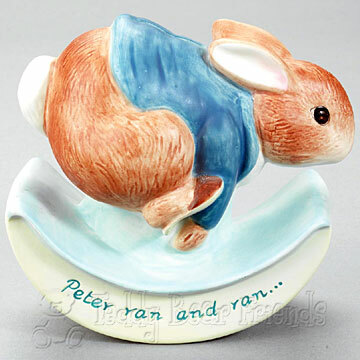 This is a superb money bank for children featuring Beatrix Potter's Peter Rabbit. Border Fine Arts - one of the worlds premium ceramic manufacturers - have produced a delightful moneybox featuring the world-famous character from Beatrix Potter's Lakeland Tales running away from Mr McGregor's garden in case he gets caught and put in pie like his father! Teddy Bear Friends loves this new first money bank for baby that is equally suitable for both baby boys and baby girls. The design is taken from Beatrix Potter's original drawings and this quality product is well made and will be a treasured keepsake. A captivating piece which would look ideal on its own or within a collection, its a must-have for any fan. Peter Ran And Ran Rocking Money Bank is made using the best ceramic processes and stands at 13cm tall. Place coins through the slot on the top of the money box - a stopper is included underneath for easy access to saved money. A delightful childrens money box for a baby Beatrix Potter fan, and a beautiful ornament too!